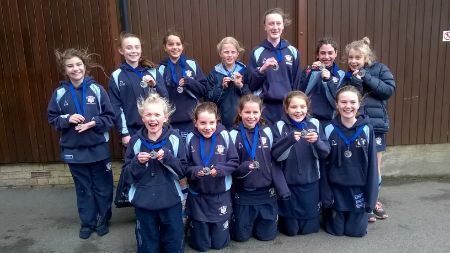 The U12A squad of 15, which included girls from Years 6 and 7, played in the highly competitive Baston Rose Bowl Tournament at DCPS on Saturday. Conditions were windy - very windy and muddy under foot, but spirits were high and we were well-supported by parents and friends. Our opening match was against Benenden and the girls 'played their socks off', resulting in a 3-0 win. MHS were next and this proved to be a really close game. Both teams defended exceptionally well (special mention to Mathilda F and Lettice A) so GKs were rarely challenged and ground balls were fought over. However, after a determined run, Bea W managed to drive the deciding goal past the MHS GK to secure the win (1-0). We went in to the final game, against DCPS, knowing that a win would secure the trophy. Despite a truly gritty performance from the team, we couldn't get the better of DCPS and the game went to them, 2-0. The whole competition had been close - both DCPS and SRS had won two matches and lost one. However DCPS was awarded the Trophy on goal difference. 45 minutes of fantastic, end to end, competitive lacrosse which the girls thoroughly enjoyed, and two very proud coaches. Well done girls! 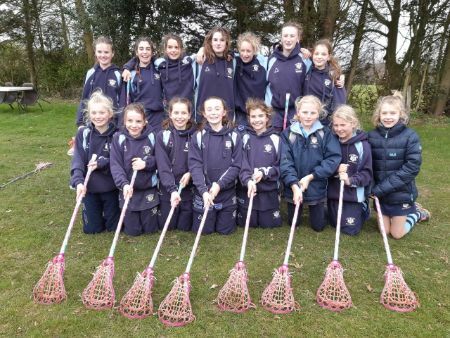 Special mention to our goal scorers, Floss S, Freya G and Bea W; to two outstanding defence performances from Lettice A and Mathilda F, and to the Year 6s in the squad, Esme C, Lottie H, Ruby A and Rachel B, who have gained valuable experience for next year. Also to Eleanor S, Florence S, Charlotte P, Lottie C, Matilda E and Rose M. Overall, an exceptional performance from the squad. What a great end to a successful week of lacrosse for Saint Ronan’s! Well done, girls.